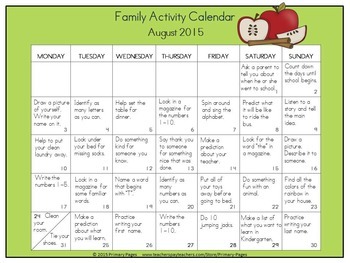 Keep the parents involved with these great monthly calendars!!! Kindergarten can be a very stressful year for both parents and children. It is a big transition for the children and a hard time for parents because they are no longer with their sweet babies all day. This is also a time where parents will have to begin doing homework with their children. At this age, homework should be fun and engaging. 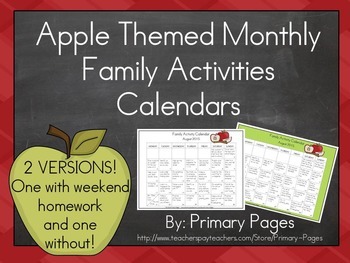 The monthly homework calendars that I have created are just that! They are filled with simple little assignments for each day of the month. You may choose to hand them out as an option to keep parents involved or you may choose to have the children complete each assignment and hand them in. The choice is yours! assignments, and one that does not. Again, the choice is yours. The assignments include Language Arts, Math, Social Studies, Science, Gym and Art. They also get progressively harder as the months pass! I hope that you enjoy these calendars and I hope that your students have fun with them as well! If you have any suggestion, please feel free to contact me through the Q&A section in my store page! If you are a fan of the AppleTheme, check out my Apple Themed Classroom Organization and Decorations . If you are looking for more ways to keep parents involved, check out my Social Studies Collaborative Homework !